Easy casserole recipes are great dinner recipes for any night of the week. 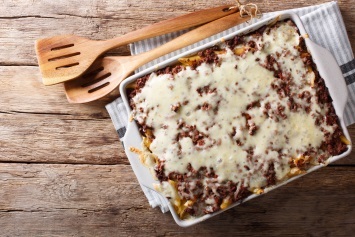 This ground beef casserole recipe uses canned soups to make the cooking sauce. Cook the egg noodles according to the package directons. Cook the hamburger and onion. Combine and mix together everything else except the noodles. Add the meat mixture and blend in most of the cheese, keeping enough to sprinkle on top. When the noodles are cooked, drain them and fold them into the meat mixture. Sprinkle the top with the remaining cheese and bake at 400ºF for 20 minutes. This casserole recipe is great served with a green salad and a side vegetable like peas or green beans. This is an easy recipe to stretch because there is lots of liquid, so by increasing the hamburger to 1 1/2 pounds and using the entire package of noodles, you can feed 8 or more people. If you prefer fresh mushrooms, which I do, use about 6 ounces of mushrooms, sliced. I would saute them a bit before adding them to the casserole but they will cook right in the pan with everything else if you prefer. Campbell soup recipes can be great for quick and easy dinners. They make life so much easier. Remember that most casserole recipes are easy to adjust to your taste. If you don’t like cream of mushroom soup, use cream of celery or cream of broccoli. I have even used cream of chicken in beef casserole recipes and it tastes just fine. Use your imagination and use your family’s favorite condensed cream soups or vegetables in the casserole. Go to our meat recipes page for more easy casserole recipes.